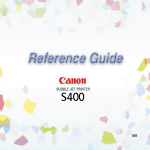 Canon i550 Color Bubble Jet Printer Quick Start Guide. © 2002 Canon U.S.A., Inc.
to know more about, or click the Help button when displayed. specialty media in the printer. for the media in use. Move to the left position for plain paper. Move to the right position for envelopes, Banner Paper and T-Shirt Transfers. the left side of the stack of paper. z Do not stack more than 50 sheets in the paper output tray. Canon recommends that you use genuine Canon media to insure optimal print quality. applications, refer to the Photo Application Guide. this section are for printing in Windows XP. Open Printer Properties dialog box. (1) Select Print from the application software's File menu. z To adjust Print Quality settings, select Custom and click Set. You can control quality in the Set Print Quality dialog box. z Select Preview before printing by clicking the check box. function to display the preview. (1) Click Print or OK.
depending on the software application you are using. The steps described in this section are for printing Mac OS 9. (1) Select the Page Setup from the application software's File menu. from the Print Mode pulldown menu. application(s) suitable for your print purposes. Instructions and follow the instructions. simple editing features such as trimming and image rotation. It is Exif Print (Exif 2.2) compatible. You can also make a Borderless Printing or Index Print without difficulty. caption them, and print them in an album. PhotoRecord is Exif Print (Exif 2.2) compatible. You can merge a selected sequence of photographs to create a panoramic photo. your Setup Software and User’s Guide CD-ROM using the Borderless Printing mode. Matte Photo Paper (LTR), and Glossy Photo Paper (LTR). flash was on or off, if the camera was in portrait or night scene mode, etc. • Easy-PhotoPrint can handled only JPEG files (filename extension: .jpg and .jpeg). (1) Insert the memory card in the computer. The 1.Image Selection sheet is displayed. The number of copies increases. The specified number of copies displayed. The number of copies decreases. (3) Load the media type specified in the 2.Paper Selection tab. camera photographs with ImageBrowser using Borderless Printing. on or off, if the camera was in portrait or night scene mode, etc. instructions on how to set the memory card in the computer. (2) Double-click the Canon ImageBrowser (alias) icon on the desktop. installed, and double-click the ImageBrowser icon in the folder. The Layout Options dialog box appears and layout selection wizard starts. (1) Select Tiled photo printing. This returns you to the Layout Options dialog box. Specify the number of photographs to print on one page. (1) Select 1(1×1) from the No. (4) Load the selected paper in the printer. z This manual refers to Windows XP operation. further details, see the user's manual for your application. Ensure that Canon i550 is selected. Then click Preferences (or Properties). Select the Canon i550 icon. In Windows NT 4.0, Select Document Defaults…. sufficient expertise to print a wide range of images and documents. offered by your printer driver. With this printer, ink tanks must be installed from the right in the order indicated below. The following message appears when ink is empty. Printing will resume as soon as ink tank is replaced and the front cover is closed. The ink tank with [X] symbol is out of ink. Replace with a new ink tank. resume printing with an empty ink tank. The BJ Status Monitor appears as soon as a print job starts. The following message is displayed when ink tank is empty. ink tank, it will be a cause of trouble. When ink tanks run out of ink, replace them using the following steps. Ensure that the printer is on, and then open the front cover. (1) Push the tab and remove the ink tank. regulations regarding disposal of consumables. (1) Unpack the new ink tank and pull off the orange tape. ink to leak out and stain your clothes and hands. (1) Insert the ink tank in the print head holder. (2) Press on the "PUSH" mark until the ink tank snaps firmly into place. z Color ink consumption may occur even when black-andwhite or grayscale printing is specified. the ink tanks, see if the print head nozzles are clogged and clean them first. Follow the procedures below and maintain the print head. ink. If it is out of ink, replace it. z Ensure that all the orange tape of the ink tank has been peeled off. z Increase the Print Quality setting in the printer driver settings. function when printed results are blurred or the color is incorrect. With the printer on, load a sheet of Letter paper in the printer. Opening the Printer Properties dialog box directly from the Start menu"
(3) When the confirmation message is displayed, click OK. Examining the Nozzle Check Pattern"
Open the Printer Utility dialog box. (2) Click Utilities to open the Printer Utility dialog box. the print head requires alignment. Clean the print head if you suspect that the nozzles might be clogged. (3) Select the ink nozzles to be cleaned, and then click Execute. (4) When the message is displayed, click OK. Setup in the File menu. (3) Select the ink nozzles to be cleaned, and then click OK.
cleaning finishes. This takes about 50 seconds. CANCEL button until the POWER lamp flashes once. pattern to verify that the print head nozzles are clean. Printing the Nozzle Check Pattern"
cleaning consumes ink, so perform this procedure only when necessary. (1) Select Page Setup… in the File menu. wait until the POWER lamp stops flashing. patterns and enter the number that corresponds. Open the Print Utility dialog box. problems. Troubleshooting usually falls into one of the following categories. Cannot Install the Printer Driver"
Paper Does Not Feed Properly"
the Guide tab and follow the on-screen instructions. routine. Close all open software applications before reinstalling the printer driver. Refer to the Easy Setup Instructions for installing the printer driver. Confirm that there are no problems with the Setup Software & User’s Guide CDROM. Use Windows Explorer to confirm that the CD-ROM can be read. Confirm that the CD-ROM icon is displayed on the desktop. CD-ROM contact the Customer Care Center. Exit then remove the CD-ROM. 4. Turn the printer off. Instructions and reinstall the driver. remains a part of the orange tape as shown in (2), remove it thoroughly. Check that your paper is loaded with the correct print side facing up. On the Main tab, confirm that the Media Type selected matches the paper loaded. cap is replaced after the removal. Print Quality not set Be sure to set the Print Quality setting to High. 2. Click the Quality icon and then drag the Print Quality slide bar to the Fine end. Adjustment and then click Set. 3. Drag the Intensity slide bar to adjust the intensity. 1. Open the Print dialog box. The Print dialog box can be opened by selecting Print in the File menu. 2. In the Print Mode pull-down menu, select Manual and then click Details. 3. Click the Color icon, then drag the Intensity slide bar to set the intensity. even when printing on plain paper, also try this. resuming printing in order to cool down. print head and its peripheral components. Wait until the print job finishes. photographs and high-density graphics can take time. BJ Print Monitor in Macintosh for the deletion. Click Yes when a confirmation message appears. 1. Double-click BJ Print Monitor in the Extensions in the System Folder. matches the size of the paper load. Your operating system may be out of free disk space. Check the available space on your computer’s hard disk. Follow the steps described below to clean the paper feed rollers. 1. Ensure the printer is on and there is no paper loaded in the printer. Repeat this cleaning operation three times. 3. Load a sheet of Letter sized plain paper in the printer. flashes three times, then feed the sheet of paper. Repeat this operation three times. the printer, even after the cleaning operation, repeat the procedures. •If you cannot extract the paper, turn the printer off, and then turn it back on. The remaining paper will be ejected automatically. take the appropriate action to correct the error. Indicates empty ink Press the RESUME/CANCEL button to resume printing with ink out condition. printer if you continue printing with ink out condition. check the contacts for foreign matter, then reinstall. After reinstall the print head, you may need to realign it. Remove the print head and check the contacts for foreign matter, then reinstall. Eight flash indicates that this tank is nearly full. is ready for use or when the print job is completed. Load paper and press the RESUME/CANCEL button. Ensure the printer cable is securely connected to the computer. 2. Follow the on-screen instructions to uninstall driver. There is a problem with the printer driver. Uninstall, then reinstall printer driver. Refer to the User’s Guide for instructions on how to uninstall the printer driver. If successful, there may be a fault in the device. Printer not properly Ensure the printer is securely connected to the computer. Printer not selected 1. From the Apple menu, select Chooser. 2. Click the i550 icon and ensure i550 is selected as the target connection. interface on which Mac OS 8.6 or later can operate. way not described in this manual. you ignore any of these safety precautions. z Do not use flammable sprays near the printer. into contact with electrical components inside the printer. as alcohol, benzene or thinners. When moving the printer, carry the printer at both ends. Never use a power supply voltage other than that supplied in the country of purchase. (alcohol, thinners. etc.) on top of the printer. proof of purchase is required at the time of warranty service. A copy of your dated bill of sale will satisfy this requirement. or other documentation for the Product. If the Product has had it serial number or dating defaced, altered or removed.